The perfect family bracelet ~ uniquely showing each member of the family. Select between 4 different styles of initials to create a bracelet that is unique to you! The $38 start price is for a sterling silver chain bracelet. If you want to add the "all because..." phrase plate there is an option to do so below. 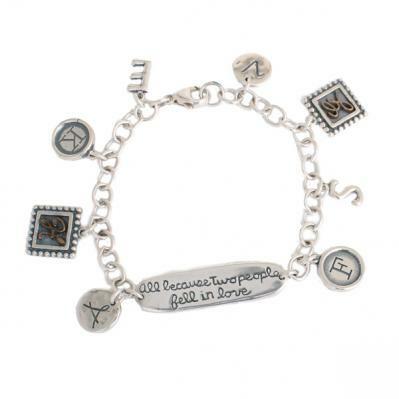 Available in 7 1/2", 8" or 8 1/2"
You can opt to have the bracelet with or without the "all because..."phrase plate. NOTE: Not all initials are available in each style - see each charm chart to see what letters are available in that style. Create a fun one-of-a-kind charm bracelet with initial charms to represent each family member. Mix the styles to create a unique bracelet! Put on an initial and birthstone for each grandchild. If you prefer you can make your bracelet with all birthstones or all initials. The charm bracelet and charms are sterling silver and comes with a secure lobster clasp. The listed price is for the 7 1/2 inch base bracelet. If you choose a larger size the base price will increase. Dimensions: Chain is approx 3/16" wide. Charms are approx. 1/2" round. The bracelet is sterling silver. Each charm is soldered onto the bracelet. The bracelet is available in 7 1/2", 8" or 8 1/2".